Well, we passed the first milestone; all the formers/moulds/jigs are cut out, and I only made a complete hash of one of them! One needs a 14mm “outer” laminating around it due to my misunderstanding of the frames v ribs question and cutting it undersize – but that will serve as good practice for the rest of the laminating I have ahead of me. As you can see the bows flaire to throw off spray when operating in rough water, and the transom has a significant tumblehome, so the moudls are made in two halves, so that they can be dismantled and removed once the stripping is complete. 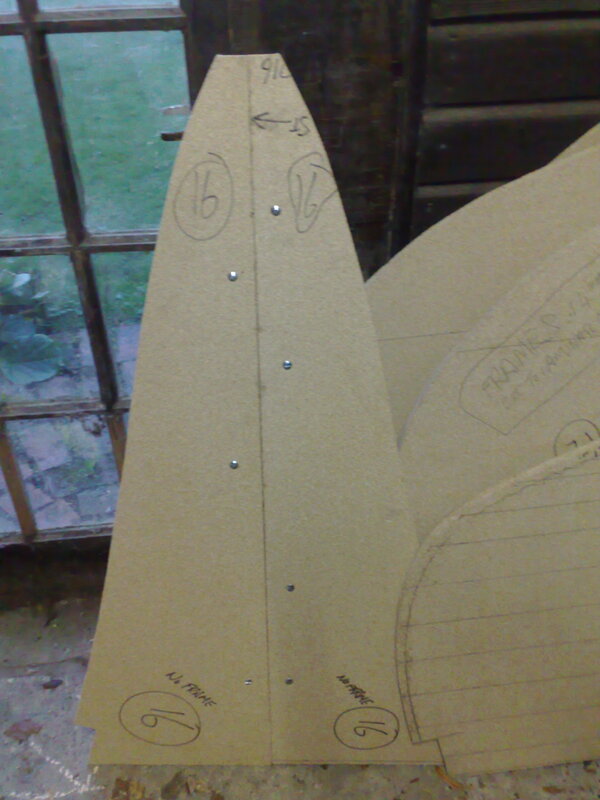 The game plan is then to cut the floors, frames and bulkheads to shape using these moulds. Having spoken to Paul Fisher he has persuaded me that we should not try to fit floors etc. prior to sheathing the inside of the hull, so I am planning to just preinstall the Hog/Stem/Transom (of course) and the Bilge Stringers and Clamp. Next up is sourcing the timber for the strongback of the building jig. I was thinking of building box sections from OSB (sterling board) to save weight and money, but “the community” has persuaded me that this is a bad plan, and I have come to agree. While I think the actual box sections should be a strong as the timbers, I concluded I could not attach the “risers” that hold the jigs in place firmly enough – It would be too hard to spread the load to acheive a stable solution… so 30+ meters of 8 by 3 – here we come! 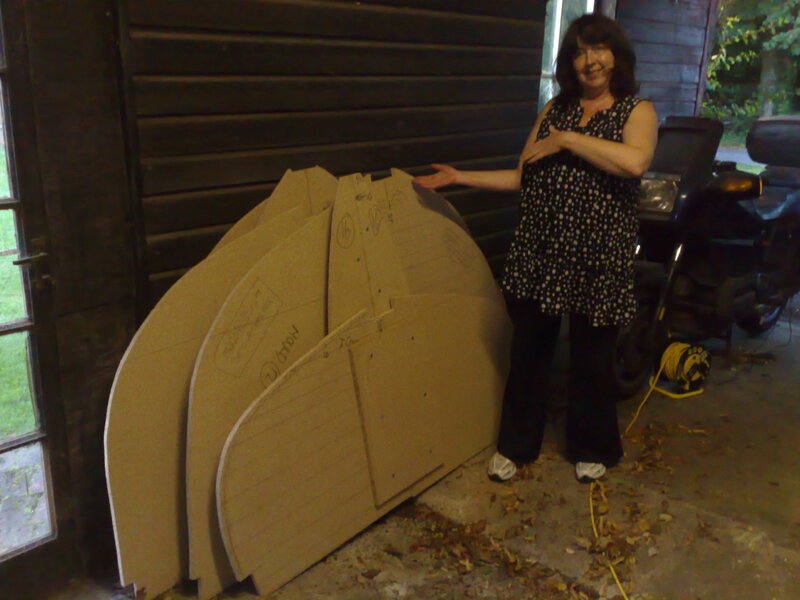 This entry was posted in Hull Build and tagged moulds, progress on July 24, 2011 by sybefur. 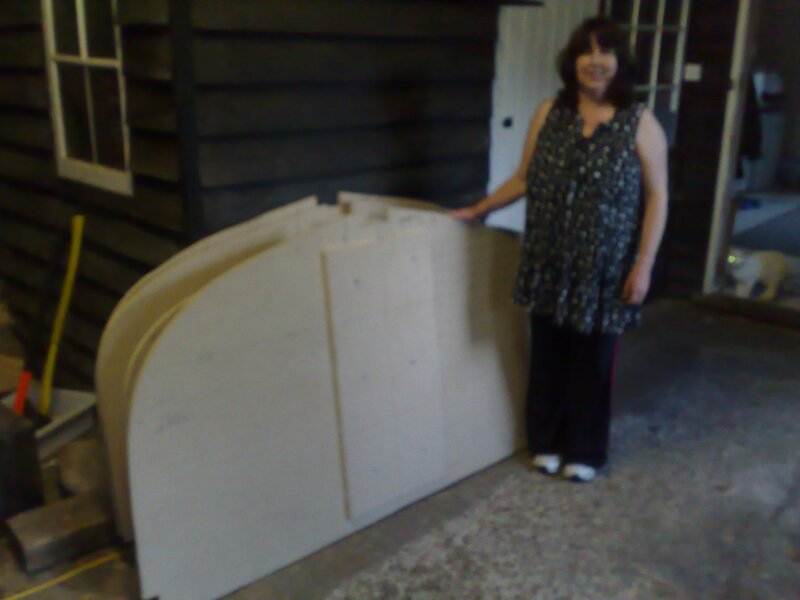 …as you will see I eventually acquired a strong back constructed from ply and 4by2 pre-fabricated sections… nice and strong and free!